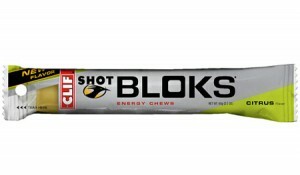 Citrus Clif Shot Bloks: I'm a fan. Who knew? If you want to get a group of runners or triathletes into a heated debate, just start talking nutrition. You don’t even have to bring out the big guns, like how many calories one should eat or whether chocolate milk is an appropriate (and delicious) recovery drink. Asking about two simple, specific things will get them going—consistency and flavor. You see, everyone is different. Generally speaking, I’m a fruit Gu girl—I can pretend it’s pie filling and get it down pretty easily, assuming I can chase it with a good bit of water. My friend Jodi, on the other hand, enjoys taking actual bites of things, even holding the leftover bits in her hand until she’s ready for another. As someone who cannot abide stickiness—oh my lord, do not even joke about Elmer’s Glue—this is problematic for me. However, I also want to make sure I have options when it comes to training and race-day nutrition, so when Clif Shot Bloks offered to send me some of its new citrus-flavored Bloks, I thought, what the heck? If I hated them, I could always give them to Jodi, right? I don’t know if it’s the flavor, or if I’m evolving, or if the consistency is actually different than it used to be, but you guys? I like these. I mean, I don’t want to pop them like gummy bears or anything, but I enjoy them. I’ve discovered that if I keep them sealed in a plastic bag and tucked in my pocket, I can eat one (or even just a bite of one) without getting anything sticky at all, which thrills me. Here’s the breakdown. In three Bloks (which are a bite or two each), there are 100 calories, 24 grams of carbs, 70 milligrams of sodium, and 12 grams of sugar, all of which feel pretty good around mile six or seven, let me tell you. I can’t believe it, but I think I’m a convert. Does this mean I’m going to have to try the other flavors now? I can’t even bring myself to try Gu, but I loved the Gu Chomps (gummy – not really sticky) during my first 1/2 marathon. I’m planning to use them again this year! I like any of the Gu products as long as they are the fruit flavors. Also, just tried the Honey Stinger line of chews which actually contain natural tea and honey for a boost of energy. Both good for a long training ride!